Including Powerex, BC Hydro’s total commitment for future energy purchases was $55.6 billion, nine months ago, an amount NOT included in the Ministry of Finance report on provincial debt, which totalled $50.2 billion. 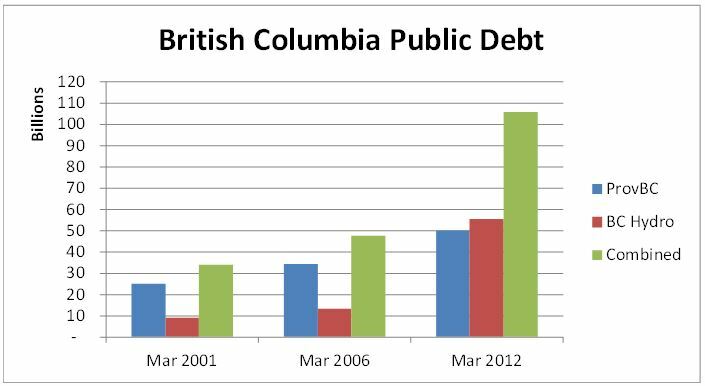 Adding the massive amounts together gives a truer picture of government debt for which citizens of BC are responsible. That amount, nine months ago, was $106 billion. Adding 3/4 of the $6 billion debt increase forecast for the current fiscal year, brings the current total above $110 billion, not including additional debt commitments arising from BC Hydro’s private power purchases. In 2006, BC Hydro commitments for energy purchases totalled $13.2 billion and other taxpayer supported debt brought the total to $47.6 billion, well less than half today’s amount. Anyone else remember when potential Liberal candidate Suzanne Anton praised the B.C. Liberal government for its “prudent fiscal management”? I don't think anyone pays attention to what that chattering monkey Suzanne Anton has to say. Useless would be a kind word to describe her time in politics. But her claim is repeated endlessly by Liberal partisans and the stenographers of the corporate media. OK so BC Hydro has incurred liabilities but doesn't it have matching income? Companies may have unfunded liabilites, pension fund deficits for example,but they aren't crystallised into debt. No, it does not presently have matching income. The prices they have contracted to pay will result in guaranteed losses. Just as former CEO David Cobb warned, BC Hydro is forced to buy electricity it does not need, at prices it cannot afford. The truth is right here….and it's scary as hell. It our job as the enlightened masses to direct people to the right information, rather than the pablum the MSM dishes out. Suzanne Anton is an insult to the brain dead. BC Hydro's website used to list all 126 IPPs selling power to BC (about 75 currently in operation). I can't find those lists anymore. 9. The most open, accountable and democratic government in Canada. Guess they missed on those two, eh? If the income doesn't match the liability the net figure is still a fraction of your $50b or so plus as I said it's an unfunded liability not part of the debt. I'm not saying the Liberals have always followed agreed accounting principles in calculating the debt but once you go beyond crystallised debt where do you stop? I invite you to consider the definition of debt. There is a certain, calculable liability to be paid. The value of the asset gained is uncertain. Has this been prudent fiscal management or is it hope and a prayer financial management? David walker, what part of buy high and sell low don't you understand? When you buy 1kw of power for $5.00 and sell it for $1.00 you have a $4.00 loss. If you have to borrow money to cover the $4.00 loss it is called DEBT. To me this is theft, not unfunded liabilities or ? ?cristallised debt.??? I think the BC Govt was conned into thinking that BC Hydro could buy power from IPPs at $100/MWh, then resell “green power” to California at $200/MWh. That didn't happen. Oops. Around 2000, the price of electricity in Calif. was $200/MWh or more, but only because Enron was ripping them off. BC Hydro is now using Enron-style accounting to hide $billions of debt, says the BC Auditor-General. Oops. I'm no apologist for BC Hydro or the BC Liberals but this is bad decision making not some conspiratorial cover up. If you buy 1kw of power for $5.00 and sell for $1.00 that is a loss but they haven't done the transaction yet so it's not yet a loss. They are called “paper losses”. If the $100b debt figure is credible why doesn't the Auditor General agree with it? He's completely independant. I see Norm Farrell has posted a dictionary definition of debt. I can't argue with the definition except to say that the accountancy profession has a more nuanced approach to the concept than your average lexicographer. 1. BC Hydro prohibited from building new power plants, except Site C.
2. The “self-sufficiency” and “insurance” requirements for BC Hydro. 3. Use of Burrard Thermal to be reduced. 4. Repeated claims of huge growth in demand in BC (which has not happened). All of these conveniently benefit the IPPs, at BC Hydro's expense. BC energy policy is apparently being written by lobbyists for IPPs. It may help to know the distinction between operating lease contracts and capital lease contracts. According to both the BC Auditor General and the Federal Auditor General an operating lease contract is for short-term arrangements. Therefore GAAP permits these obligations to be reported as liabilities other than long-term debt. To use an analogy, it is like anyone of us declaring only the minimum payment needed to stay current on a $50,000 credit card debt. The capital lease contract is different as it requires presentation as a long-term debt. In terms of a payment obligation on an issued long-term bond, the reporting shows the one year interest as a current liability and the remaining principal owing as a long-term debt/liability. What BC Hydro and the government have been doing is classifying as many long-term contracts in the operating lease category to avoid disclosing them as long-term debts. The AG has been after them about this deception for at least 5 years. 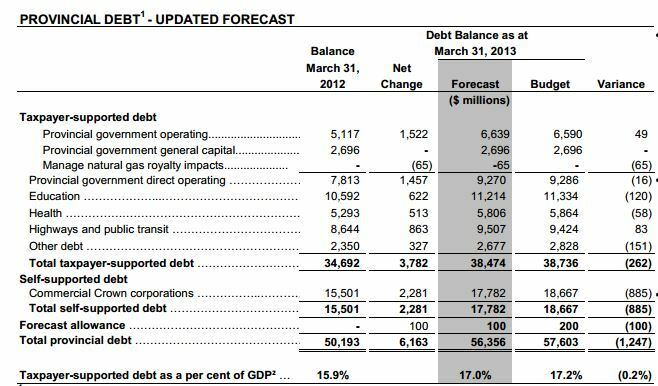 We know the BC Government owns up to having $50.193 Billion and another $20 Billion of short-term liabilities (March 2012. We also know the AG mentioned there is undisclosed debt of another $80 Billion. It is easy to see we get past $100 Billion in a hurry. Thank you. An excellent comment that should blow the false claims of BC Liberal apologists out of the water. But then, they're only doing what they're hired to do aren't they. Too bad that media people like Bill Good repeat the lies so readily.